May the words in this book be an inspiration for you when and as you need it. Read it by the page, one day at a time, or at random as you are so moved. Know that you are worthy of joy, that you deserve to have joy in your life. May you take this time to find joy and may you know peace and love. 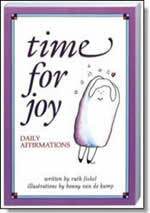 Ruth Fishel, M.Ed., is an acclaimed author of inspirational books that have sold nearly a million copies, including A Time for Joy, Change Almost Anything in 21 Days, and The Journey Within. As the cofounder and former director of Serenity, Inc., she now teaches, writes and presents workshops and retreats throughout the country, helping people become whole and healthy using the tools of meditation, affirmations, and visualizations. Visit her website at www.ruthfishel.com.